Tweets Influencing Google's Ranking More? Home > Google News > Google SEO > Twitter Too Influential On Google's Rankings? 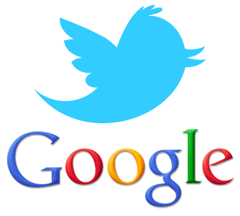 Twitter Too Influential On Google's Rankings? We know both Google and Bing use social signals for rankings, even more so today from when I posted that article. In fact, some are worried it plays so much of a role that expert content will be effected negatively by the growth of social. In any event, some webmasters at WebmasterWorld are suggesting that Google, since Panda, has turned the dial up on how much influence tweets from Twitter play in ranking content in Google. I just noticed that google is giving more weight to Twitter (the backlinks you may get from twitter) since Panda. So if your site gets tons of tweets you're likely to rank. I think he is confused because most of those backlinks are discounted. It is more of Twitter's signals outside of a backlink, which in a sense are kind of like backlinks. Hope that makes sense, if not, ask in the comments. I have noticed that Google is paying attention to url mentions in Twitter also. My analysis showed that Twitter was just a small part of a very big Google algorithm that looks at many different other elements. In any event, we know Google is looking at social for ranking signals but is it enough to make a huge ranking difference? I am not sure. Is it too much to be too influential on Google's rankings? I am not sure.